Lenzie? WTF? Since when has Lenzie ever been in Stirlingshire? By christ on a pole it has been cold over the last week or so, this has severly limited my intent when it comes to looking up stuff to write for this here blog. When I have managed to make it out of my pit I did though look up Falkirk FC's place in the Stirlingshire FA's representative matches. 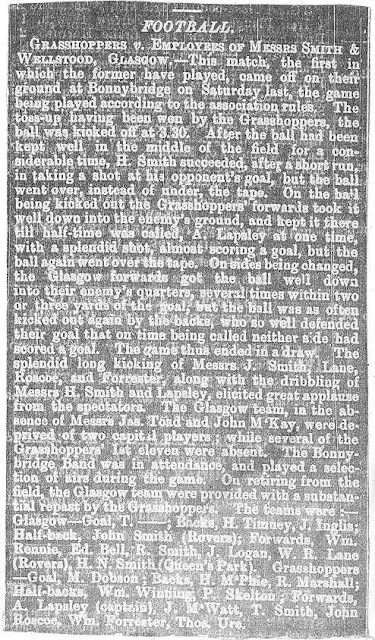 Back in the early days of football as an intermediary level between club and international football there also existed in Scotland representative county matches. Sadly it was never fully organised, and matches were organised on an ad hoc basis depending on free dates in the calander and other factors. On some occasions they were used by the selectors as part of the national selection process, but generally they were glorified friendlies, albeit with a bit more prestige for the players themselves. Through time these games died out, professional leagues etc, filled the fixture lists, and counties agreed to less and less matches as clubs refused to release their, then profesional players, they were finished by the end of the 1890s. The matches were organised by the respective County Football Associations, which in turn were formed out of their senior clubs. Falkirk, of course, were [and still are] part of the Stirlingshire FA, in fact were founder members, and were represented in every Inter-County match Stirlingshire played. 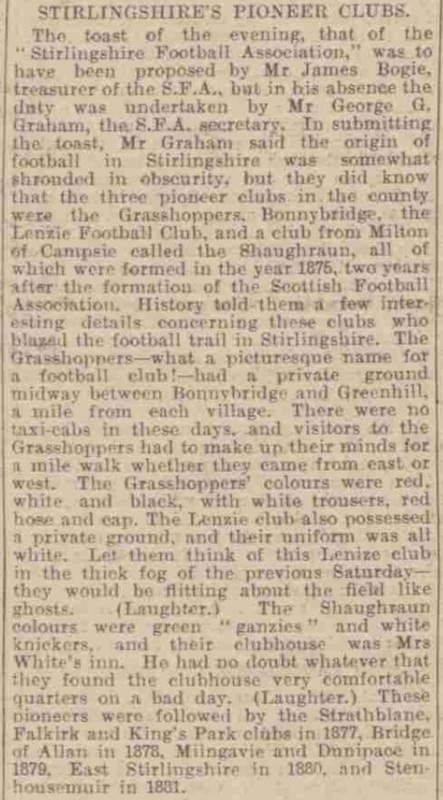 During the 1890s the Stirlingshire XIs were mainly turned out against clubs or combined Junior XIs in benefit & testimonial matches, and quite often had to be fleshed out with reserve players, these matches have been excluded. Here follows the full list of Falkirk players involved in Stirlingshirs Matches against other Counties & FAs. @ In editions of the Falkirk Herald & Mail it was often said, contradictally, both Alex Stark and Alex Inches [East Stirlingshire] were the most represented players for Stirlingshire. I believe that the figures may be of total medals, including Stirlingshire Cup Medals, the point is moot. Both Alex Stark, Alex Inches & Lawrence McLachlan [also ESFC] were those constantly there & there abouts at the time. + Thomas McDonald often played under his mother's maiden name as Tommy Donnelly confusing matters. * David was only playing with Falkirk FC 2nd XI at the time and was travelling with the Stirlingshire FA in a capacity as official when a player did not show up, meaning David had to play. % This was the same player who later went on to play for Scotland, and is constantly referred to as W.Watson in other places, he was from Shotts and had previously played for Dykehead & East Stirlingshire. I don't know what to make of this, obviously the players ought be proud of being chosen, however Stirlingshire never played the Glasgow FA, and only once played the EoS FA. 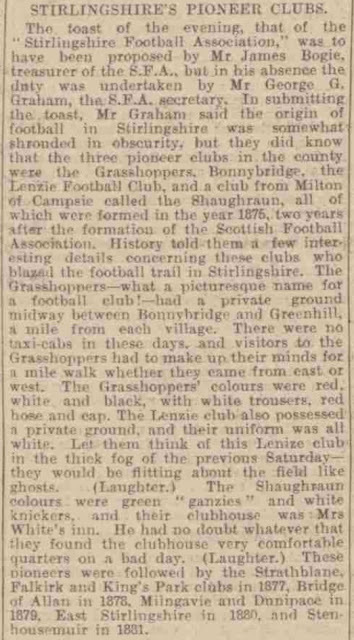 The honours were spread around to keep both the 'big teams' & 'wee teams' in Stirlingshire happy. I say, though, take it as is, a reflection of local football which is no longer available.